218 pages | 19 B/W Illus. 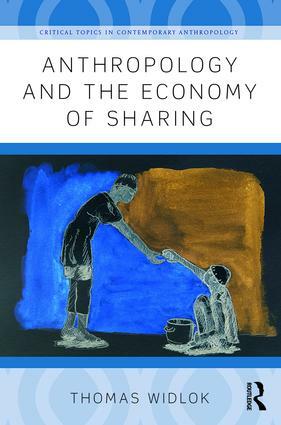 This book examines the economy of sharing in a variety of social and political contexts around the world, with consideration given to the role of sharing in relation to social order and social change, political power, group formation, individual networks and concepts of personhood. Widlok advocates a refreshingly broad comparative approach to our understanding of sharing, with a rich range of material from hunter-gatherer ethnography alongside debates and empirical illustrations from globalized society, helping students to avoid Western economic bias in their thinking. Anthropology and the Economy of Sharing also demonstrates that sharing is distinct from gift-giving, exchange and reciprocity, which have become dominant themes in economic anthropology, and suggests that a new focus on sharing will have significant repercussions for anthropological theory. Breaking new ground in this key topic, this volume provides students with a coherent and accessible overview of the economy of sharing from an anthropological perspective. Thomas Widlok is Professor for African Studies and Chair for the Cultural Anthropology of Africa at the University of Cologne, Germany.